Alessi Lily Bird Soy Sauce Container. Alessi 2.7oz Modern Japanese-Sushi Soy Sauce Bottle/Dispenser and Serving Pot Lily Bird ASG103X. Alessi Lily Bird Soy Sauce Container; a functional kitchen accessory with great style. A signature Alessi design, this cheerful and contemporary soy sauce bowl will brighten up any kitchen. Sure to be a conversation piece, this bird-shaped soy sauce bowl features a unique approach to design that is both playful and elegant. This new family of objects is part of ongoing collaboration with the National Palace Museum in Taiwan, which began in 2007 with the �Chin Family�. What role has the Museum played in this project? What form did its involvement take? In actual fact, it was coming into close contact with the extraordinary collection of art works at the National Palace Museum that set Stefano�s imagination racing, inspiring him to explore the millennial tradition of Chinese applied arts and develop his own contemporary interpretation of them. This interpretation is in keeping with the playful style of which our designer is an acknowledged master, a characteristic that, in the designs presented today, takes a very new form. It is important to remember that the objects presented here, just like the ones in the �Chin Family�, characters or flowers and fruits, each performing the roles of domestic household objects, are made partly in hand-decorated plastic and partly in fine bone china, also hand-decorated. The magic of Giovannoni�s design lies in the fact that these objects recall the grace of 18th century ceramic trinkets, while at the same time being utterly contemporary! On the occasion of this new collection, the book �OrienTales�, conceived and designed by Stefano himself, is currently being prepared for release by the publishing house Gli Ori. The book describes the design process behind the origin of these small household objects, with a number of texts and many lovely illustrations. Giovannoni Stefano. Alessi "Lily Bird" Soy Sauce Container. The most beautiful songbird has a new function as a dispenser for your favorite sauces! This is no angry bird � in fact, he's downright jolly. This perky soy sauce container is so much fun to use, you'll want to order sushi every night. 1. 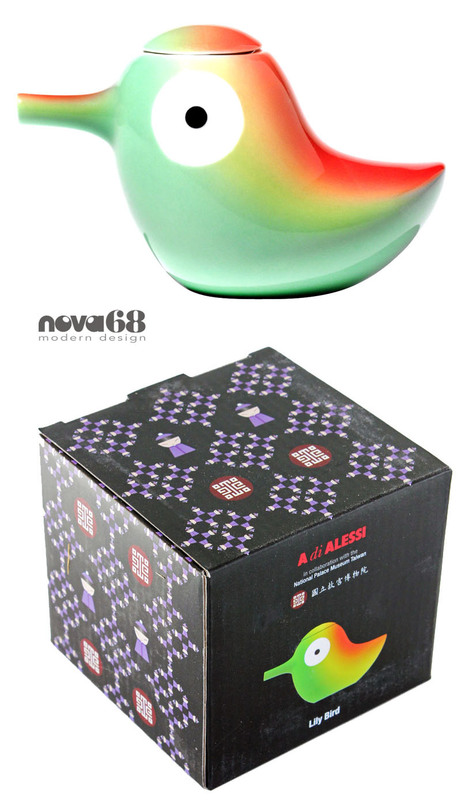 15% Lowest Price Guarantee on any Alessi product.